Homeopathy is a system of medicine that is based on the principle that like cures like. Samuel Hahnemann, the founder of Homeopathy, was the first person to purposely utilize this method of treating disease. Hahnemann disagreed with the accepted reason why the medicine quinine helped in treatment of cases of malaria. He began to take quinine on a regular basis, and after a short time produced the symptoms of malaria in his own healthy body. The symptoms would disappear when he stopped the medicine, only to appear again if he repeated the dose. He concluded that quinine was good to treat malaria not because of its bitter quality, but because in crude form, it could produce symptoms of the disease. Hahnemann then began to treat patients according to this principle, using smaller and smaller doses of the medicines. He found they would not only respond, but would have few of the side effects that were so common to the medications used by more conventional practitioners. He theorized that the Homeopathic remedies, in their minute doses, carefully selected to match all to the patients symptoms, gave the body the information it needed to heal itself. Although no one has been able to prove or disprove this theory, Homeopathy is accepted in most parts of the world today as a very scientific method of treating disease. Homeopathic remedies are given internally in extremely small doses. Hahnemann discovered that by putting the remedy through a series of dilutions, and agitations he was able to make it more potent in action each time; therefore, the diluted medicine is said to be in a potency. A commonly used potency is 30c: the original substance has been diluted 1 drop to 100 drops and agitated; then 1 drop of this mixture is diluted in 100 drops; this process continues 30 times. The final solution is absorbed by small sugar globules which are taken orally. When giving remedies to horses I usually dissolve 4-5 pellets in 12cc spring or distilled water and squirt it into the horses mouth with a syringe. Most horses take the medicine very willingly. The medicine is absorbed by the mucous membranes and does not need to be swallowed. In severe acute conditions the medicines / remedies can be given every 15 minutes for up to 4 doses, or until a response is seen. Less severe / acute conditions require less frequent dosage, anywhere from 1 to 24 hours apart. If 4 doses of the remedy have not brought a response, then it is probably not going to act because it is probably not the correct remedy for that set of symptoms. In any case, the medication is discontinued as soon as the animal is obviously moving toward recovery. These are the remedies and their potencies I use most frequently for first aid treatment with horses. A beautiful but poisonous plant that grows on the mountains of France, Switzerland, and Germany. The primary indication for Aconite is acute, violent fever and inflammation. Aconite would not be considered after pathological changes have occurred. Acute influenza is a classic Aconite case. Complaints often come on after exposure to dry cold weather, but extreme heat may also bring on symptoms. Anterior enteritis type colic may be treated in itís early stages with Aconite. The mental state is one of fear and anguish. This remedy is excellent for horses that panic when asked to perform such tasks as trailer loading, clipping, or entering a show ring. Aconite would not be the choice for the horse that just doesnít want to do something. Aconite is one remedy to consider for acute cystitis in cats. The typical reaction to a bee sting gives the picture of Apis. Swelling, edema, soreness, intolerance of heat and the slightest touch are classic Apis symptoms. Apis is most often used for allergic reactions with puffy-type swelling. It can be life saving in an acute anaphylactic shock-type reaction. Another use for Apis would be joint swelling with heat, excessive fluid, and pain. In mares, Apis may be used for ovarian inflammation and cyst formation, especially when on the right side. Apis patients lack thirst in most cases, but may occasionally show extreme thirst. A flowering herb that is routinely used by Herbalists and Homeopaths. It is applied topically in tincture form for injuries, but homeopathic preparation allows itís internal use. Arnica is a remedy that no household should be without. It is used primarily for muscle soreness and bruises. It should be the first remedy given for all injuries, then other remedies can be given based on the individuals healing response. Arnica should also be considered for any symptoms that develop post injury. Head injuries are notorious for causing persistent symptoms long after the original injury appeared healed. Septic conditions may also respond to Arnica. This extremely toxic chemical is a powerful homeopathic remedy. Consistent with homeopathic principle, it is used for treatment of symptoms that Arsenic would cause if ingested in crude form. For one, it is used to treat food poisoning (i.e., garbage gut in dogs, moldy feed enteritis in horses). General symptoms that would indicate Arsenicum include restlessness with extreme exhaustion, bloody diarrhea and vomiting, and putrid discharges. Any discharges in Arsenicum cases are thin and irritating. The patient is usually very thirsty, but only for frequent small drinks. Arsenicum is a very deep acting remedy with many indications in all animals. It is a good remedy to learn in depth for treating chronic diseases. It should be considered for any patient that is restless, fearful, thirsty, and chilly. This remedy can be used internally but is more commonly applied externally in lotion, gel, or ointment form to open wounds. It is excellent for speeding the healing of wounds and for repelling insects from wounds. Another favorite of Herbalists and Homeopaths, Chamomilla is most famous for itís calming effects. It is often called the "teething baby remedy." Mothers depend on Chamomile to relieve teething, earache, and colic pains in children. 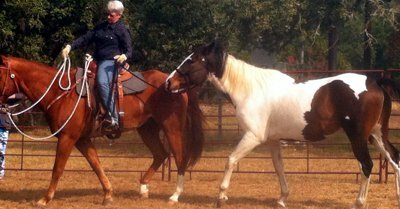 In horses Chamomilla is primarily a colic remedy, but it also seems to be helpful in stressful situations like trailering, especially where the horse's actions would indicate that he might experience motion sickness or nausea from stress. Spasmodic, cramping pains are typical. Animals who are overly sensitive to pain will be most likely to respond well to Chamomilla. Mental calmness contra-indicates Chamomilla. It may also be helpful before any anxiety-producing event. Another toxic plant with medicinal properties, Colchicum is primarily used for joint stiffness. It is also an excellent remedy for colic in horses. These horses will be very bloated with high pitched gas sounds heard when listening over either flank. It is best used in conjunction with Nux Vomica as many gas colic cases also have an impaction of the intestine. The horses may pass a small amount of manure covered with mucus. Another popular herb, Hypericum is a great remedy for injuries to nerves, especially of fingers, toes, and nails. Excessive pain is a symptom of injuries needing Hypericum. It can help prevent tetanus after puncture wounds. It can also be used for pain after surgical operations. It is excellent for injuries to the spine. It is good for dogs and cats that get their tails caught in doors or horses that set back and fall on the base of their tails. It should also be considered for animal bites and lacerated wounds with accompanying weakness from loss of blood. It is an excellent toothache remedy. Externally it is used in lotion form to ease the pain of damaged nerves such as after a nail puncture in the hoof. This poisonous substance in crude form creates in the patient on oversensitivity to external impressions. The patient reacts violently to light, sound, or odors. The Nux Vomica type may also react negatively to drugs. It is frequently used by Homeopaths to start cases that have been heavily medicated. Many skin conditions respond well to Nux Vomica initially, but other remedies may be needed to finish the case. Spasms and constrictions are typical of Nux Vomica which makes it a good choice for cystitis in cats. Nux Vomica is a good remedy for impaction colic in horses. The colic cases are not as painful as those needing Chamomila. It is very important not to forget the mental state when treating something like colic. For example, the Aconite case may be in a state of anguish, the Chamomila case is irritable, and the Nux patient downright mean. Overeating and lack of exercise are often in the history. it is especially useful for show horses on high grain rations that spend extended periods confined to their stall. Pulsitilla is primarily a female remedy. As a general rule these patients have a wonderful gentle disposition. They love attention and cat owners especially will report how affectionate they are. However, Pulsitilla can have its peevish side, particularly mares that change their personalities dramatically when they come in heat. Pulsitilla is a great remedy for abscesses in all animals and summer colds in horses. Discharge are thick, bland, and yellowish green. Pulsitilla patients dislike heat, lack thirst, and prefer to be outdoors. Silicea is indicated in ailments secondary to defective nutrition and will often help with the assimilation of minerals. Poor quality, dry cracked hooves are a primary indicator in horses. A tendency toward abscess formation also suggest Silicea. Scarring after injury and ill effects of vaccination also make Silicea a choice. It is a deep acting remedy and should be considered for many chronic cases. In addition to the previous symptoms the constitutional Silicea may be sensitive to heat yet chilly, have swollen glands, and have an excessive dislike for hypodermic needles.